I hadn't really done much coloring in my imaging software before, so it was enjoyable but I was falling off the computer chair by the time it was finished. Now I'm trying to figure out how to make the color image of the four borders. Since the drawings are different sections of the border and some things are repeated, well sigh, I'm just not sure how to overlap them. Wish me luck today! 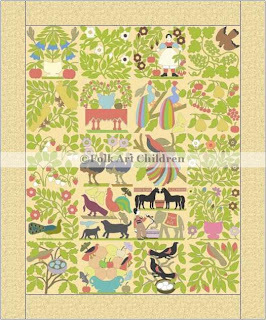 I began drafting this quilt for myself since I want the blocks to be square and I wanted to follow the original border (just love those birds and horses and big ol' dogs). But I'm also thinking of putting all of this on a CD in case anybody is interested in the pattern but I don't know how to do that either LOL! There are soooo many images involved and on a CD, I could include the color pictures of each block as well. Forge on, Karen. OMG That sounds like an almost impossible task! Of course, many of us will be interested in the finished product. Do you intend to publish and sell the pattern? You amaze me. I don't know how to do what you have done to get to this point. my neck would be killing me if I sat at the computer that long! hope you figure that all out a cd would be awesome! I would be *very* interested in this pattern! You are far more gifted than I with your imaging software. 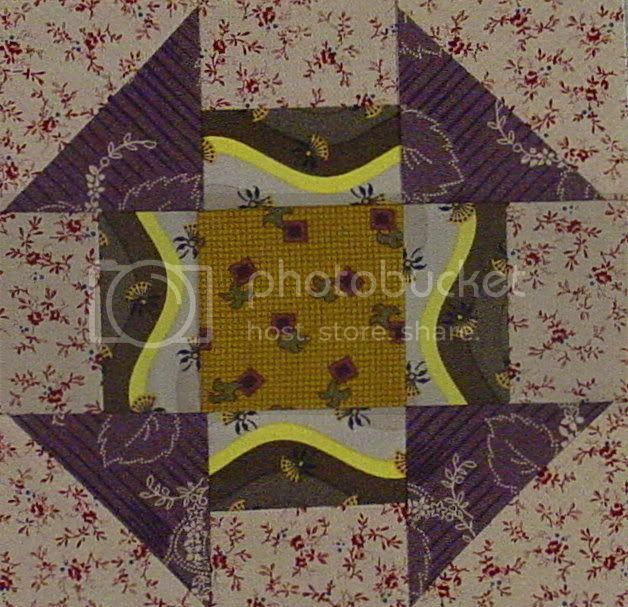 I did once take a photo of an antique quilt and enlarge it, on my computer and on my printer, to make a full-size block (it's a "Flowering Almond" applique block). I should get back to that one of these days. It looks wonderful. I can't imagine the time it must take you to do this! Wow, Karen, the design of that quilt is amazing! Don't sell yourself short, you are doing a fantastic job. You really should sell your designs! Your design is amazing! I think you should definitely sell it as a pattern. I know how hard that quilt was to make..amazing! WOW Karen, it looks amazing...it is going to be one gorgeous quilt!!! p.s. you asked about my barn photo - I used a texture called "distress 2" from Kim Klassen, she has wonderful textures she sells for Photoshop! Holy Cow, Karen! The quilt and your design work are amazing. I would love this pattern. It's all applique? I could start on it this winter and in 30 years I will have it completed! Seriously, you need to package and sell this pattern. If you want a "tester" for it, let me know. However, you may not want to wait the 30 years!